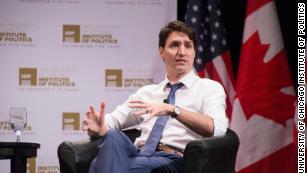 Washington (CNN) President Donald Trump boasted at a private fundraiser Wednesday of making up trade claims during a meeting with Canadian Prime Minister Justin Trudeau before knowing whether they were true. Trump said he asked an aide to check if he was correct in telling Trudeau the US runs a trade deficit with Canada. “I sent one of our guys out, his guy, my guy, they went out, I said, ‘Check, because I can’t believe it,'” Trump said. According to figures provided by the Commerce Department, the US ran a $2.77 billion surplus with Canada for 2017. That figure includes oil and timber. It’s unclear what Trump was referring to with the $17 billion figure. Trump doubled down on his claim Thursday morning. “We do have a Trade Deficit with Canada, as we do with almost all countries (some of them massive). 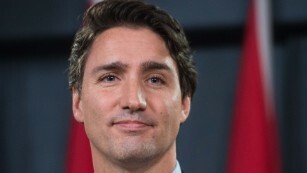 P.M. Justin Trudeau of Canada, a very good guy, doesn’t like saying that Canada has a Surplus vs. the U.S.(negotiating), but they do…they almost all do…and that’s how I know!” he tweeted. Trump has similarly boasted about pressing Trudeau about the US’s supposed trade imbalance with Canada before, most recently at a December rally in Pensacola, Florida. But he didn’t include the “I didn’t even know” reference, and it’s unclear whether it was an admission that he made up the claim. Trump’s comments came during a half-hour speech to raise money for Republican Senate candidate Josh Hawley, who’s challenging Missouri Democratic Sen. Claire McCaskill. 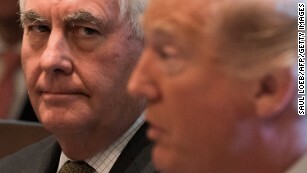 During the fundraiser, Trump also called the North American Free Trade Agreement a disaster and blamed the World Trade Organization for allowing other nations to box in the US on trade. The President mocked other politicians for supporting NAFTA, attacking Mexico as “spoiled” and arguing that Canada had outsmarted the US, the Post reported. CNN’s Chris Isidore and Kevin Liptak contributed to this report.